We spent weeks, months, selecting a kitchen counter top. I looked online at Countertops 101; I looked at the big box stores; I read articles about all the different materials we could use for our countertop — the pros and cons of each. While I was considering this, Consumer Reports came out with a timely article on what was the best, and I read the article five times. I even took a quiz — what kind of countertop should YOU have in your kitchen? Soapstone was my pick early on — I just needed to convince Mr. H. C. of its amazing and beautiful qualities. 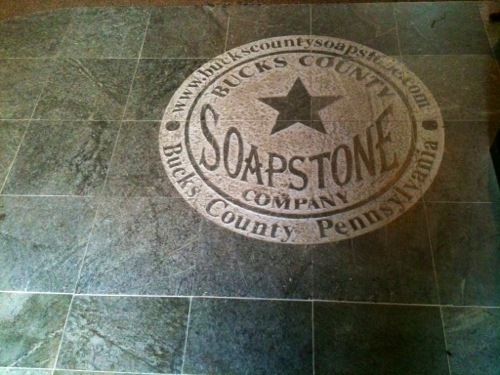 There’s nothing like a firsthand look at the gorgeous stuff, so last fall we visited Bucks County Soapstone in Perkasie, PA.
Everything in their showroom highlights soapstone — even the floor at the entrance is soapstone tile. 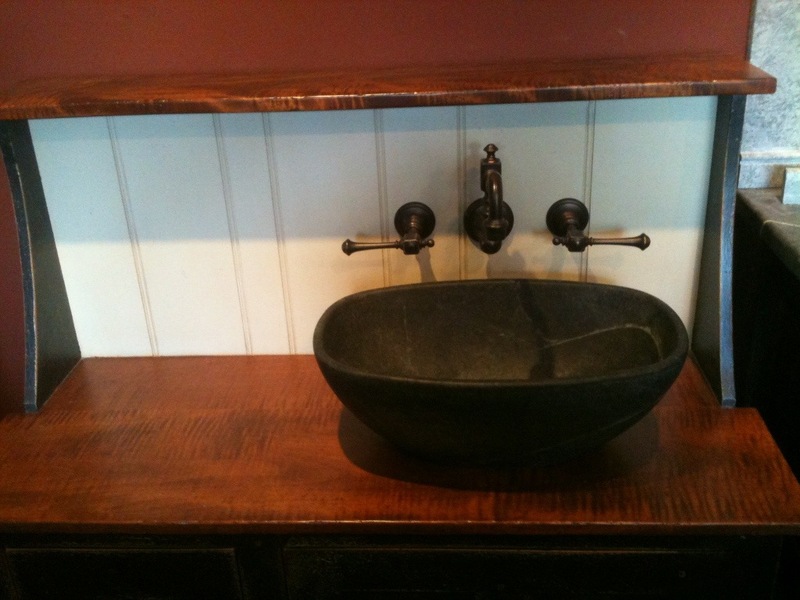 Perhaps you would like one of these cute little basin sinks? 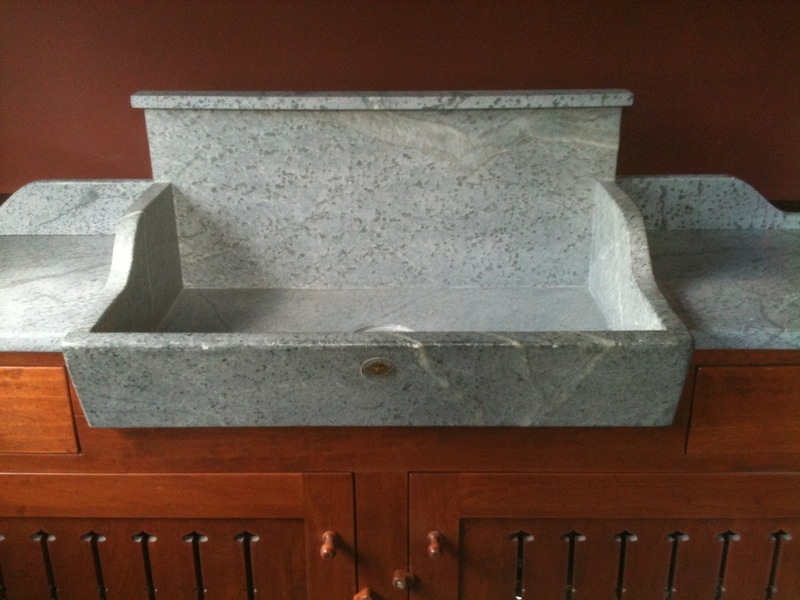 Or a wonderful soapstone laundry tub? From the time they received our plans to when it was ready for pickup was three weeks. I had this week off from work, so we planned a road trip across Pennsylvania. We left Henry looking out the window — six hours in the truck was almost too much for us, let alone Henry, whose vehicular limit seems to be about 60 minutes. We perked up when we landed at our B&B — The Fox and Hound. The innkeepers were perky, the room was nice, and the breakfast was good — all for a hundred bucks — which is about what you would pay for an impersonal, adequate hotel room. We try to stay in B&Bs whenever we can. 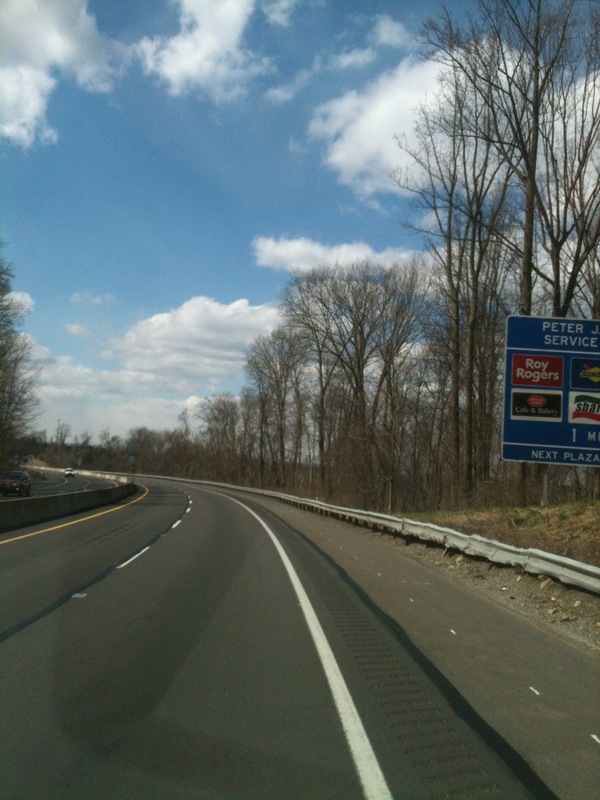 Bucks County is beautiful and certainly deserves another trip — or a vacation even — in warmer weather. The little town of New Hope is charming, but by the time we got out on the town on a Tuesday evening, all the little touristy shoppes were closed (which was a good thing for the budget). So we made do with $3 stouts, and burgers and pork tacos at the local brew pub, the Triumph Brewery. Just what truck-weary travelers needed. The next morning we were at Bucks County Soapstone by 10:15. I wandered around the showroom, snapping photos, and talking to Scott, while Mr. H. C. hung around with the guys in the shop finding out tips for installation and loading the truck. 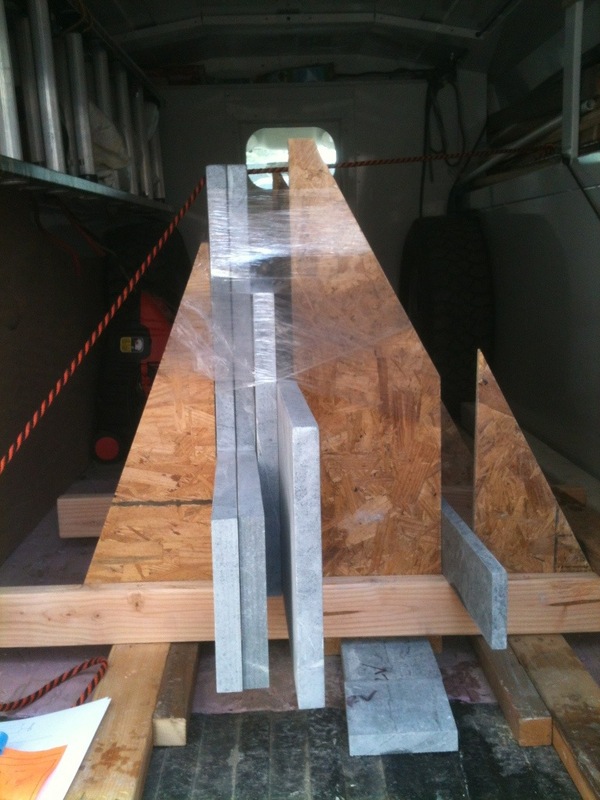 The guys in the shop built this handy dandy A-frame so we could safely haul our precious cargo. No road trip is complete without lunch at the local diner, and we found a great one! 10. It is a naturally occurring material with minimal processing and as little or as much upkeep as you want. 9. Do you want natural gray? Do you want polished black? You can have either. And you can even change your mind. 7. It scratches easily, yes; BUT the scratches can just be sanded out using regular 150 grit sandpaper and a circular motion. 6. It lasts for years and years and years. 5. Most soapstone dealers are smaller, family or individually run places, so you aren’t supporting the Big Box stores. Given this factor, you get personal attention. 3. It is naturally anti-bacterial. 2. There is NO chance of radiation or radon entering your home with soapstone. 1. It is so beautiful! Wonderful and so helpful! I am not looking for counter tops but enjoyed your journey. 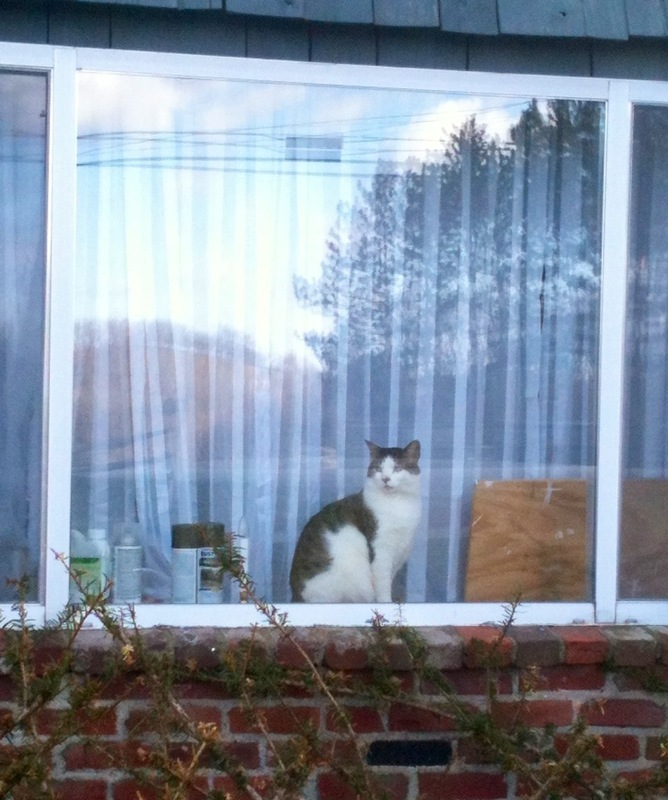 I bet many people would love just the picture of Henry your cat! I really loved the pictures of the road trip! I went with countertops that the everyone ‘poo-pooed’ but I figured it was my decision. 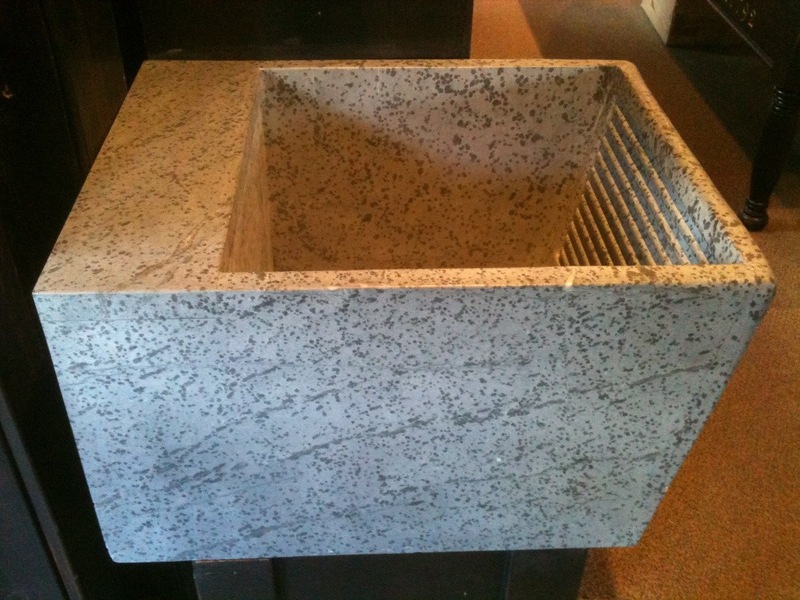 Enjoy your countertop – they will be beautiful. But now I’m curious — what did you pick — and more importantly, are you happy with it? That’s a cute B&B, we always stay at them too. I love the smaller feel and never feel the same in a hotel. We’re off to California in a week and have chosen b&B’s for San Fran, Napa and San Jose. Henry’s adorable! My cats start mewing before I roll out of the driveway, ha. It’s nice to support a family business: we’re currently house hunting and will look into this option if we need to do kitchen work. I loved your journey and Henry looking out of the window made it so real. You brought back all my memories on the road when I lived in the USA and that’s something that’s hard to bring back, especially the details and yes…countertops!